Zoë, a Girl Scout Ambassador from Georgia, says that when she was in middle school she thought bullying would never end. But now that she's in high school, she has found ways to move past it, including Girl Scouting. 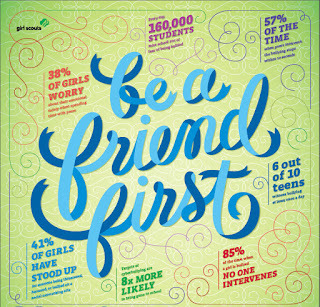 Girl Scouts of the USA recently launched BFF (Be a Friend First), a national bully-prevention initiative for middle school girls. Based on GSUSA's popular aMAZE! leadership curriculum, the program helps girls to recognize and intervene in bullying situations and lead positive change in their schools and communities. Sadly, statistics show that when a girl is bullied, 85 percent of the time nobody steps in to help her. Additional research shows girls are more likely to bully others subtly, through relational aggression--manipulating their relationships with other girls online and off--as opposed to using physical aggression. The same studies also show that bullying behavior peaks in middle school, when the need for social acceptance is high, making this a crucial time to help girls learn to prevent bullying. "Girl Scouts is about growing girls into leaders, which includes teaching girls to recognize when something is inhibiting their development, such as relational bullying," said Anna Maria Chavez, Chief Executive Officer of Girl Scouts of the USA. "Giving girls the skills, support, and tools they need to stand up for themselves and others is a key component of leadership. We are creating a program that, with the guidance of adults, can help girls to make their world a better place on an issue that is important to them."